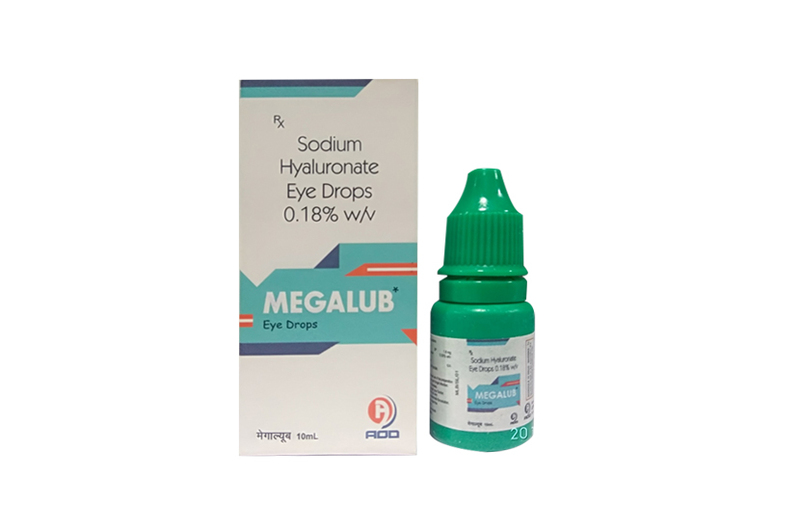 MEGALUB- Eye Drops (Sodium Hyaluronate Eye Drops 0.18%) is sterile ophthalmic solution. Sodium Hyaluronate Eye Drops are also known as 'artificial tears'. They are used to relieve eye dryness and soreness. They moisten, soothe and lubricate the surface of your eye, making it feel more comfortable. MEGALUB- Eye Drops contains Sodium Hyaluronate, a natural polymer which is also present in structures of the human eye. The special physical characteristics of Sodium Hyaluronate mean MEGALUB- Eye Drops has important viscoelastic properties. MEGALUB- Eye Drops provides a stable coating on the surface of the eye thus allowing, for its lubricating and hydrating properties, a very low resistance to movement such as blinking and assuring protection during the healing processes of corneal epithelium. MEGALUB- Eye Drops therefore combines long lasting relief with maximum comfort. MEGALUB- Eye Drops is preservative-free and has excellent tolerability. MEGALUB- Eye Drops for the relief of burning, irritation and discomfort due to dryness of the eye due to exposure to dust, smoke, air conditioning, extended computer use or contact lens wear. May also be used as protectant against further irritation. Relieves dryness and provides soothing, refreshing and cooling effects. MEGALUB- Eye Drops is Sterile ophthalmic solution is contraindicated in those individuals who are hypersensitive to any of its components. Do not use if the container is damaged. Do not use in presence of quaternary ammonium salts. Do not use if you are sensitive to any of the product components. Do not use after the expiry date reported on the bottle and on the external package. Do not touch the eye with the tip of the bottle. Leave at least 10-15 minutes between administration of any other ophthalmic drugs for external use. Do not use with contact lenses. Surgical aid in the anterior segment during cataract extraction and intraocular lens implantation Adult: Slowly admin a sufficient quantity into the eye. MEGALUB- Eye Drops is supplied in one white polethylene Bottle packed with printed labelled & cartons and such 25 cartons packed in a shrink sleeves & corrugated box.